Osram Opto Semiconductors has released the Synios P 2720 family of packaged LEDs that have a encapsulation architecture designed specifically for coupling to LED light guides, primarily for automotive LED lights applications but also capable of serving in other consumer-electronic applications. Osram has also just released new products in the infrared (IR) Oslon Black family with increased output for surveillance and inspection applications. The new Synios P 2720 has 15 different models of packaged LEDs that are all 2.7×2×0.6-mm in package size and that all have the same solder-pad pattern. But Osram offers the LEDs in phosphor-converted white and yellow models, and in monochromatic yellow, red, and super red models. Besides, the company offers different light levels achieved by varying the internal LED chip length, with 500-µm, 750-µm, and 1-mm emitters available. The packaged LEDs focus on automotive daytime running lights (DRLs), tail-light clusters, and position lights. Most high- and low-beam LED headlights would require higher-output LEDs. For example, Osram offers the Oslon Black Flat and Ostar LED families for LED headlights. Still, light-guide-based features are increasingly popular in both the LED headlight assembly and in rear-facing automotive LED light. For example, Osram supplied the LED technology behind the LED headlamp unit that is standard on the 2015 Ford F-150 trucks. Light guides provide the wow factor in that application. Osram says the 120° wide emission pattern and the compact size of the new Synios LEDs make them ideal for light-guide usage. Moreover, the packaged LEDs deliver 110-lm/W efficacy in white models and even 80-lm/W efficacy in red. The white versions range in output from 85–310 lm depending on chip size. The LEDs also perform well at elevated temperatures — an important factor in the harsh and open environment. Osram released a graph that shows only a 10% drop in flux output for the white LEDs as the junction temperature rises from 60°C to 120°C. Technical development teams can begin designs based on the new LEDs now. "Nine of the 15 Synios versions are now available on the market," said Thomas Christl, LED marketing for automotive at Osram. 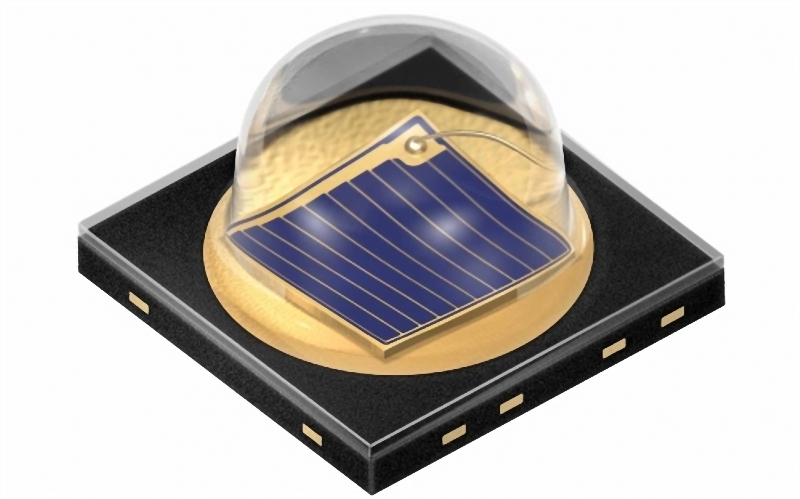 "The remaining InGaAlP LEDs with 750-µm and 1-mm chip will follow in the summer. Along with the compact dimensions, various levels of brightness, and different colors, the variety of types opens up a high degree of flexibility when it comes to lamp design." Meanwhile, in the IR LED space, a technology that the company calls IREDs, Osram has new products for camera-based applications such as surveillance and industrial inspection. The IRED component can provide IR illuminations over a distance greater than 100m. The company said the new SFH 4715AS and 4716AS LEDs provide 70% greater output than standard IR LEDs. Given that the output is outside the human visible spectrum, the maximum output is characterized at 1.37W when driven at 1A, referring to radiometric power out. The company also said that the improved performance comes in part from the latest LED chips and an optimized package, although a new technology called Nanostack provides the largest gain. The company did not fully explain the Nanostack technology but said each chip has two emission centers. "After only a brief interval we are now presenting the same component with further improved output," said Jörg Heerlein, marketing for infrared at Osram. "The new Oslon Black Stack produces more light and can therefore provide even better lighting performance over large distances than the previous versions."